TRF Forums • View topic - Decent 'adventure' boots? 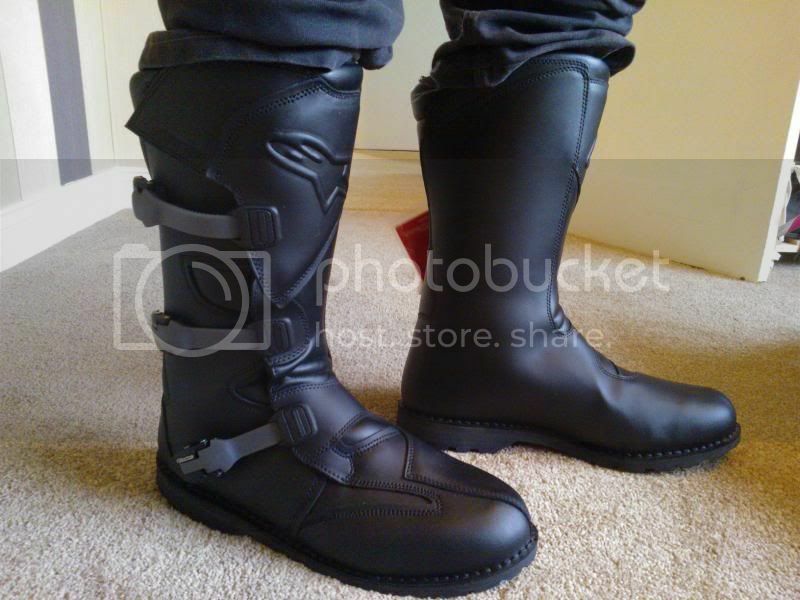 Post subject: Re: Decent 'adventure' boots? I believe the TCX x-deserts are about on par with the toucans and are about £220 I think. Those TCX deserts look good. I'll see how I find my purchase when they turn up and keep the TCX's in mind as an alternative. I still like those Toucans though ! Sorry, I take back what I said - looking at other videos it appears the X-Deserts are not as protective as the Toucans. The Sidi Adventures do appear to be the most protective goretex adventure boots I can find. I will be buying a pair very soon. I watched the video on the X deserts, they look a little too flexible. My Alpinestars Scouts turned up. I like them, very well made, they look and feel like a quality product. Comfortable (untested on the bike yet) but supportive and protective. I know other boots are more protective but these seem to offer a good balance. The boots are quite high so offer more protection to my long lower legs. The waterproof lining goes high up the boot to stop water pouring in. I was surprised at some waterproof boots where the inner gusset only goes half way up- a downside when it comes to river crossings. Picked up some Sidi Adventure boots yesterday, fair chunk of money but got a discount at £260. I like them so far. I did look at the Alpinestars Toucans in Hein Gericke, but they're around £350. Very nice boots but not sure they are worth more than the Sidis. I went looking at the TCX Infinity boots and came away with a pair of Alpinestar Scout boots. On comparing the boots it seemed that the Alpinestar Scouts were a better boot,with a solid construction with full grain leather easy to use buckles etc. The boots are strong but understated in style and non damaging to the bike. Also the boots were on offer at £125 which sealed the deal for me .At the full retail price i would have made further comparisons before buying. I have had the boots for 18 months and have used the boots on several continental trips and found them to be good boots and well worth the money paid for them. Having owned and worn out numerous boots both road and off road ie Altberg, Akito Fieldsheer,Sidi,Gaerne, Alpinestar Tech MX 5 pairs Hein Gericke etc. etc. They are nice and comfy on the bike but I can't walk very far in them.... guaranteed blisters! http://www.nomadracing.co.uk No Byways were harmed in the making of this blog! TCX Infinity...fantastic boot for road riding in the winter, but I wouldn't contemplate trail riding in mine.